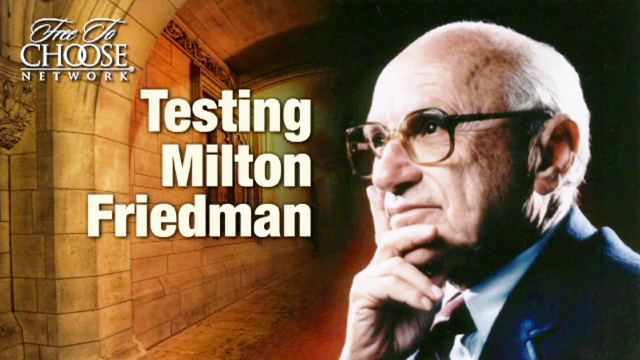 Testing Milton Friedman revisits some of the basic ideas championed by economist and Nobel laureate Milton Friedman in his 1980 PBS series and bestselling book Free To Choose. This new three-part series, hosted by veteran journalist Emily Rooney with a distinguished panel of two Friedman advocates and two challengers, presents a lively discussion and debate on Friedman’s still-provocative ideas in each of these hour-long programs. In this, the 100th anniversary of Friedman’s birth, special emphasis is placed on the relevance of his ideas in view of the current world economic situation. In Episode One, “Equality of Opportunity,” the panelists explore Friedman’s ideas and the possible implications of equality of opportunity and equality of outcome. The panelists include: author, syndicated columnist and the John M. Olin Distinguished Professor of Economics at George Mason University, Walter Williams; Senior Policy Analyst at Reason Foundation, Shikha Dalmia; political blogger Matthew Yglesias; and President and Advocacy Director of the Sargent Shriver National Center on Poverty Law, John Bouman. Episode Two, “Government Control,” is a discussion of what can occur when legislators, often in collusion with big business, intervene in the market. This program features author and syndicated columnist and a Director at the George W. Bush Institute, Amity Shlaes; Professor of Economics at George Mason University, Research Fellow at the Mercatus Center and author Bryan Caplan; former Chief Economist for President Obama’s Economic Recovery Advisory Board, a member of the Obama Cabinet and Professor of Economics at the University of Chicago’s Booth School of Business, Austan Goolsbee; and Pulitzer Prize-winning journalist from the Chicago Tribune, Clarence Page. In Episode Three, “Free Markets,” the panel discusses the classic explanations and demonstrations of the workings and benefits of a free market and economic freedom. The panel is composed of the following individuals: the George J. Stigler Professor of Economics at the University of Chicago and a Senior Fellow at the Hoover Institution, Kevin Murphy; the Eric J. Gleacher Professor of Finance at the University of Chicago’s Booth School of Business and an economic advisor to the Prime Minister of India, Raghuram Rajan; author and Professor of International Political Economy at Harvard’s Kennedy School of Government, Dani Rodrik; Professor of Economics at the University of California at Berkeley and Deputy Assistant Secretary of the Treasury in the Clinton administration, Brad DeLong.